Rojava is a place where in the last years a system based on radical democracy, women’s liberation and ecology was developed. Since the beginning the revolution was under constant attack from the Turkish state and different Islamist groups within Syria, one of them being the Islamic State. Within the resistance against the Syrian Regime, the Islamist gangs and the Turkish attacks, the Revolution spread to whole Northern and Eastern Syria, integrating different religions, cultures and ethnicities into the revolutionary creation of a self administrating society. However The people of Northern and Eastern Syria are now again under direct threat from the Turkish state which after the war and occupation on Afrin wants to attack further and in fact totally destroy the revolution of Rojava. The Turkish fascist state can not life next to a project like Rojava, with Is based on the values of democracy, women’s liberation and ecological economy. These values are in total contrast to Erdogan’s policies. -capitalists and anti-fascists. Only in a common struggle we can build up democratic and ecological societies. Therefore, today, at the global day of action to defend the revolution in Rojava, we would like to send our greetings of solidarity to all those different struggles all around the world. All around the world people are resisting against the exploitation of the natre. * The Gitimt’en and Unist’ot’en Camps in Canada, where Indigineous among others are resisting against resource extraction of the region and set up camps directly in the way of a planned pipeline project. * We want to salute our comrades at the Hambach Forest in Germany. Since years activists are protesting in many different ways against the forest being cut to be replaced by the biggest lignite mine in Europe. * We want to remember the days of resistance of the ZAD in France. People stood up against the plans to destroy the nature by building an airport close to Notre-Dame. And while squatting the area experimenting and developing new ways of living together. * Since many years protests are resonating in the whole world against the Ilisu dam project of the Turkish state. The state wants to build this giant dam which will have a tremendous impact on the surrounding areas of Kurdistan and would mean the flooding of famous historical site, Hasankeyf. * we want to greet all the students and the youth, which are taking the streets every Friday to demand a future worth living in. we, as the global youth, are the hope for a future society, that will live in harmony with the nature. We know, that there are many more people and movements, worth mentioning. And there are many more we don’t even know until today. But even so, our thoughts and our greetings are also to them. All this struggles are part of a world-wide struggle for building up a democratic and ecological society. In the time of global capitalism and climate change we have to unite our forces to ultimately change the system. As all our struggles have to face the capitalistic logic of exploitation and the repression of nation states. Also we in Rojava with our ecological work of Make Rojava green again, are facing the threats of the Turkish regime. The Turkish attack on Afrin in 2018 has shown once more what kind of impacts on the nature a war and a Turkish occupation will have. For this reason the highest priority for us became to Defend Rojava, to defend what was achieved so far. Because without the land, there will be no place for us to build a ecological society. 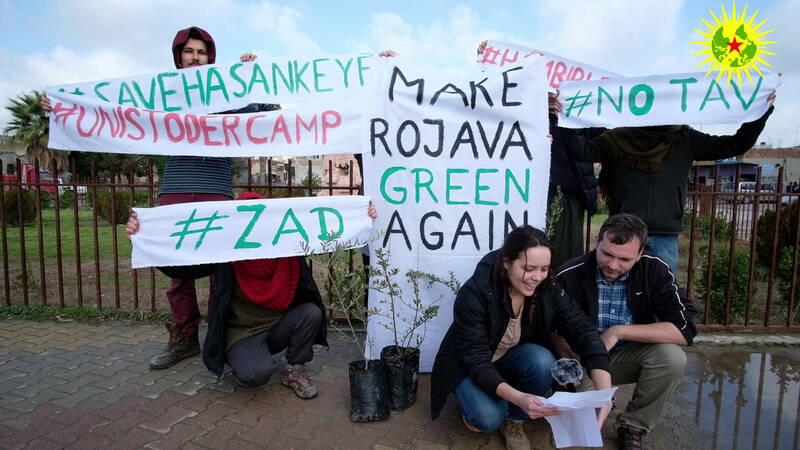 That’s why, Activists of the Internationalist Commune had to stop planting trees and joined the society in different places, to help with preparation for self-defense against an Turkish attack. For the same reason we joined the Mobilization for the International Days of Resistance on January 27th and 28th. We call on all our friends, groups, people participating in the world-wide action today- to get together in the spirit of the Revolution in Rojava. To start to discuss how to unite for an ecological and social revolution worldwide. As last point, we want to send our love and respect to Leyla Guven and all the comrades who are in indefinite hunger strike to break the isolation of Abdullah Öcalan, the main thinker of the Revolution in Rojava. Since 1999 he is imprisoned on the Imrali island in Turkey and currently in total isolation. That is why, to defend the revolution in Rojava, also means to break the isolation of Abdullah Öcalan.